In case of extensive copying activities, you would like to check whether everything has actually gotten copied properly. You are thus looking for a suitable quality control tool. With ‘fciv.exe’, Microsoft provides a command line tool that calculates checksums and hash values of files but is not very widely known. 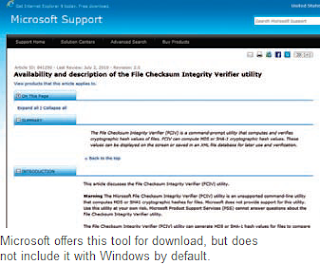 The program name stands for ‘File Checksum Integrity Verifier’. You can use it for checking the copying process of files. The tool can be found at http://support.microsoft.com/kb/841290. Start the installation with administrator rights via the right-click context command ‘Run as administrator’. After accepting the license agreement, click ‘Browse’ in the next dialog box and navigate to the Windows folder. There you can unzip the program so that it is available on the system path. In order to use it, open a command line window via ‘cmd’ in the start menu. With ‘fciv’, you can get additional information about using the individual parameters. In principle, the tool generates checksums from the output data and saves it in a database file such in the XML format. These values can later be compared with the calculated checksums of the copied files. In order to check the files from c:\ data’, type fciv c:\data -r -bp c:\data -xml result.xml. Here, the ‘r’ option ensures that all the sub-folders are also recursively included and the ‘bp c:\data’ option ensures that the basic path ‘c:\ data’ is not taken into account. The results are saved in the ‘result.xml’ file. The copied files can later be checked against the database with their checksums. For this, you can use the command fciv v bp g:\data xml result.xml. It checks the folder ‘g:\ data’ that for instance should contain the copied files against the checksums in ‘results.xml’. If this is not the case, you get an error message; else, a confirmation stating that all files have been successfully checked. Moreover, you can also list the checksums of all individual files with ‘fciv list xml results.xml’.